(4) International aid strategies and policies evaluation, as an independent Expert in International Health and Global health (for over 15 years) analyzing the contribution to Health and Development and to the implementation of Health MDGs of the following institutions: UN agencies (UNAIDS, UNDP, WHO), France Ministry of Foreign Affairs, Agence Française de développement and ESTHER/MOH France, the European Commission, the World Bank, the Global Fund to fight AIDS, TB and Malaria, the USAID, PEPFAR, the German Technical cooperation, etc. over the period 2000-2016 (detailed trip mission tasks and countries visited are outlined below). (5) currently working as a Medical Doctor specialized in Public Health and Social Medicine in Paris, taking care of street people, migrants as well as drug users, in all dimensions: administrative, juridicial, social, medical, psychological and psychiatrically. Association Charonne (2017-ongoing). Human rights and health have been central to Dominique Kerouedan’s work throughout the regions she visited and policy discussions she had with country authorities, civil society stakeholders, and leaders of international institutions. While she was working as a Medical Doctor in Refugee camps it became clear early on that Medicine and Public Health skills were not sufficient to respond to the extremely bad and unequal Afghan women’s and girls’ health conditions, nor to Karen adolescent fighters’ health knowledge, so as to reduce the mortality affecting these populations. Education, empowerment, political will and peace, to name a few issues, notwithstanding human rights mainstreaming, had to be taken into consideration if we were to succeed. Coming back from the camps Dominique Kerouedan decided to work with Amnesty International’s Medical Commission in Paris, as well as the Juridical Commission, at the time when the Teams were preparing an international symposium on the involvement of medical doctors in torture and the death penalty in countries suffering from sharia apartheid, regimes or dictatorship (South Africa, Pakistan, Mauritania, Latin American countries, etc.). The title of the symposium became the title of her thesis for the Doctorate in Medicine: “Medicine at risks: Serving or Undergoing Repression”. This work led her to think further about how we could improve populations’ and health workers’ conditions, taking into consideration State Sovereignty issues and International Public Law constraints. This is what took her to then study International Public Law through a bachelor’s in law. Ever since, and over the last 30 years, Dominique has kept an eye on human rights and health, whether working on HIV/AIDS programs, Maternal and Child Health issues, raising awareness on sexual violence in conflict or post-conflict contexts, examining the distribution of ODA among countries and speaking out about the inequity and inequality of financial allocations, despite existing, though imperfect, allocation criteria, etc. 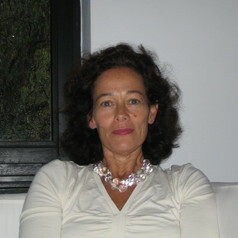 Dominique Kerouedan’s stands on France and the European Union’s policies and strategies, acknowledged by the European Court of Auditors, or her publications in the press, in professional journals, are well known and much appreciated, both by the students, the professionals and the political stakeholders targeted. The French Government and Institutions, and well-known respected academics commissioned Dominique Kerouedan to do important policy work on: (i) France’s contribution to health MDGs, (ii) France’s contribution to PPPs, (iii) France’s contribution to disease alert and surveillance, particularly in the area of infectious diseases, etc. (refer to list of publications). Her experience and vision led Dominique Kerouedan to pull medical and health issues outside Medicine, or even Public Health, and take them to the attention of future leaders, be they prepared to work with public institutions, private companies, or public-private partnerships. The famous Sciences Po Institute of Political Studies in Paris approved the relevance and importance of raising awareness about health, human rights and development issues, and accepted Dominique’s proposal of offering a Global Health program customized to the students of International Affairs’ profiles and future positions and leadership. The objective of the Concentration in Global health she’s founded at the Paris School of International Affairs, is to raise political interest and generate professional legitimacy for them to deal with major upcoming health challenges, wherever they work and whoever they work with in the upcoming world . Having worked in many countries around the world most of my life, I enjoy working in teams to find the best way of improving the right of everyone to reach the best attainable physical and mental health, to enjoy health as freedom, just as Amartya Sen suggested we see “development as freedom”. This is still what I am working at, while I take care of the health and rights of street people, migrants, asylum seekers and drug users in the city of Paris, working as a Medical Doctor. In 2012 Dominique Kerouedan was awarded the Chair “Knowledge against Poverty” in the most famous academic institution in France, the renowned Collège de France, where distinguished scientists have taught since 1530, when the King François 1er invited “les Lecteurs Royaux” to teach the general population . In 2016, Dominique was elected corresponding Member of the National Academy of Overseas Sciences in France, and in 2017 corresponding Member of the National Academy of Medicine, where she’s currently Rapporteur of the Working Group entitled: Les migrants: aspects sanitaires, sociaux, économiques et éthiques”. Since September 2017 she is working as a Medical Doctor specialist in Public Health and Social Medicine in 2 health centres in Paris (La République), one for women, one for men and women, street people, drug users and migrant people, looking at their health globally: medically, socially, mentally, etc. and at their access to health, health insurance and protection rights in France. She just was elected President of the La Cimade Luxembourg Local Group of Volunteers who are accompanying asylum seekers throughout their jurisdictional procedures, or other migrants seeking other resident permits.